All things considered, last week's return to meal planning went quite well. We did end up eating out two nights instead of just one, but based on the pattern of the last sweet forever, this is an improvement. Basil Pesto Chicken got bumped until another week since we ate out, but I am looking forward to trying it soon. As for leftovers, we ate them. Except for the beans, bless their little bland hearts. Oh well, thank goodness beans are cheap. Friday: I'ma gonna type leftovers but I think we all know what we'll be doing, don't we? 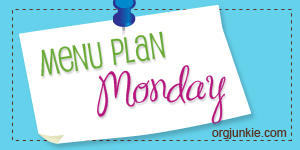 I'm linking up with Menu Plan Monday at OrgJunkie.com, be sure to pop over there if you're needing some meal planning ideas! That salsa chicken recipe is my easiest go-to recipe of all time! I found it on a friend's blog once and even though I don't love chicken I knew the speed factor would more than make-up for my chicken issues. thanks for the kick start. it is always so much easier in so many ways when I plan the week's menu! don't know why I fall out of habit at times. going to try two of your meals here this week. will likely do the salsa chicken next week. And There Was Skating. Lots and Lots of Skating.